We had a tough week this week, no doubt about it. But, we survived it together by joining our resources, leaning on each other, and showing a tremendous amount of professionalism. I can’t begin to thank everyone for the solidarity in teaching, learning and relationships when all around us our students and several staff were living various levels of stress and sadness. From the alternative bell schedules for heat days to the loss of a former student, I watched our united effort help get us through the week. Thanks to those who provided the stability of the classroom environment each day. Thank you for pressing on with teaching and learning, rushing to comfort our grieving students, maintaining our literacy plan, readying our safety protocols, and stepping up to celebrate at our pep assembly. This week I witnessed true solidarity in solace. Can you believe we are already in the third week of school? I am guessing that this week will go as fast as last week. We have two days in our forecast that could present some heat challenges. Be thinking ahead about what that may do to your instructional plans. If we do not have early outs (which is entirely possible), then we do have a Red/White day plan for moving the hottest rooms into cooler ones for 3rd and 4th blocks. I will send that out if needed. Also this week, I will be sending out the PBTE list for who is going to be evaluated this year. When you receive the email, please drop by my office to pick up your PBTE booklet. Monday during CAMP, we will be getting the freshmen together in the auditorium for them to learn about Student Council at Benton. ALL students will report to their CAMP classes first and wait until we announce for the freshmen to be dismissed. Do NOT send students directly to the auditorium. Then next week, we will begin our CAMP meetings where a student from each CAMP will come to meet with administration for our first all school meeting. Who will your CAMP send? How will you determine who represents the group? This should be a topic your CAMP discusses this week. 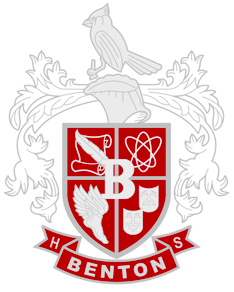 Wednesday, there will be a Leadership Team meeting after school at 2:45 p.m. If your department chair is unable to attend, please make sure someone from your department is there to represent. Thursday and Friday, Sept 1st & 2nd, we are going to start our short department meetings to share the AQ Survey data and Senior Survey data. In addition, both Danielle Holmes, Amy Fowler, and Karen Cox will join us to answer any questions about upcoming areas of expectation in SpEd, data teams, and CAMP. Department chairs should send me the location we will meet each collab block with your department. Departments with the same collab time (for example: CA&SpEd, SS&IT): Department Chairs should get together to establish a common location for both groups to meet together then let me know where that will be. All departments should plan on meeting in the first 30 minutes of the block. Man oh man. I knew it was going to be a good start. We looked great at the convocation thanks to MSG Rivera, MAJ Stackhouse, and JROTC. The staff picnic lunch was a huge hit. We received not only positive feedback from several of you about our PD, but we got a ton of constructive input to how we could make our learning better and more applicable to all staff. Our Back to School night, despite limited advertisement, turned out to be a very popular event for our parents and students. They loved it, and many comments were made about how friendly and helpful our staff was Monday night. All in all, the first days of school seemed to run very smoothly. I appreciate everyone’s comments on how helpful our new instructional coach was in solving operational issues and making sure those problems got solved. I also appreciate the cooperative spirit of the entire staff – stepping in or stepping up to make sure all important or priority matters were taken care of. And of course, no one can deny the “Pièce de résistance” of the week…our Pep Assembly and Jamboree! Many thanks to everyone who made that happen — cheerleaders, poms, band, fall coaches, and JROTC — and hats off to Coach Fowler for a great game rally. And the game. What a feat! Great job football coaches for getting our players ready for a great win! It was the best way to end an incredible week! 1. CAMP — We are talking to the kids this week about credits required to graduate. Make sure you talk through this thoroughly. Use the “token sheet” and share with the students that without exception it takes 25 credits (ie. like game tokens) for a diploma and how they go about earning each credit (or half credit). It seems easy, but they often forget about earning credits in categories (subject areas). And most of the freshmen really don’t understand this at all. 2. Start strong on our literacy plan. Make sure you remember to include your vocabulary word, SSR on Wednesday, and Eyes Past Print (EPP) at the end of the week. My word this week will be MOMENTUM. How could it be anything else? 3. Don’t forget to turn in all class change requests. The deadline is FRIDAY! Please explain to students that requests for class changes may not all be given due to large class sizes or lack of class availability in a student’s schedule. 4. The new district Emergency Response Charts should be posted in your room near your door. On Friday, administration will complete a building walkthrough to ensure all departments are prepared. Do not forget to add class rosters and paper slips for fire drills (to turn in when students are missing). Departments in 100% compliance will be getting ice cream treats the following week. Yay! 5. We are having a Pep Assembly again this Friday. Think…MOMENTUM! At the assembly, we will be honoring the golf, tennis, cross country and softball teams. Fall coaches, it’s round two. Keep the spirit alive! We will work on our new cheer,(staff, be ready to take the floor and show the students our spirit) and make sure you share with your CAMPs how the cheerleaders are introducing new cheers on the bulletin boards each week.